Oreo is a very loving, outspoken cat. I just had a few questions. She gets afraid of other cats/humans other than me. Is this normal in a tuxedo cat? Oreo is so cute. Thank you for sharing his picture! 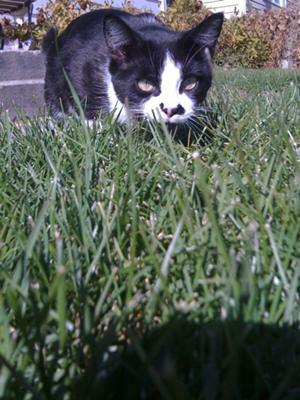 As to your question, as far as I know tuxedo cats are friendly, like most cats. However, each cat is different. There are small differences in temperament based on their breed (tuxedos can occur in different breeds), but overall tuxedos are friendly and very smart. There are, of course, many factors that can influence a cat's behavior. It might be that Oreo hasn't had a chance of socializing with other pets and/or people so he is not comfortable around them. Did you adopt him as a kitten or as an adult? My cats, by the way, are shy with strangers. But they are quite friendly with people they know.